Wow lots of FREE yogurt today! Who wants free Voskos? 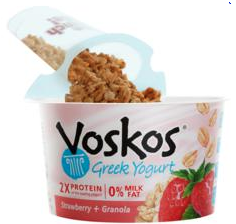 Watch a 30-seconds video athttp://www.voskos.com/fresh/media/voskos-plus-granola, email the three captions that appear in the video (three reasons to enjoy Voskos plus Granola) plus your address to FB (at) Voskos.com, and get a one-week supply of Voskos plus Granola, in the form of 7 free product coupons mailed to your home.